Autumn is making its transition into winter, which is upsetting for a few reasons. Now, us Michiganders need to prepare for the long and cold winter up here in the Mitten, which is far from pleasant. One of the last things that we as home and business owners need to tend to before we can officially call it winter is clean up all of the dead leaves that clutter our yards and walkways; it’s hard to appreciate all of the autumnal glory that the arbors up in Michigan display when we know that they’re only going to fall down in a few weeks and cause a mess. As a tree service, we’re far too familiar with the annoyance of dead leaves and because of this yearly rite of passage into the depths of winter that we must face every year, we thought it would be beneficial to give you all some methods of disposing the leaves. Dead leaves are still leaves, and they’re made from organic matter that provides nutrients to the soil upon decomposition. If you let them decompose naturally without raking them up, the grass and plants in the area within the dead leaves are going to receive all of the nutrients! Unfortunately, the leaves don’t always fall exactly where we want them to, but that’s why rakes and brooms exist! Rake the leaves into a pile and, for the best effects, shred them with a lawnmower. 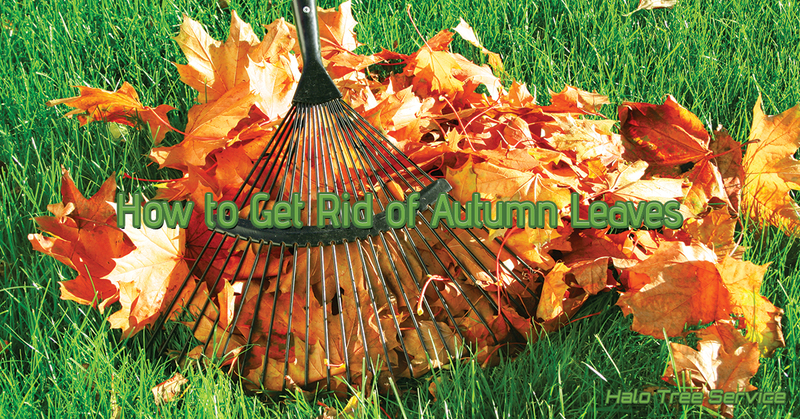 Shredded leaves decompose faster than full leaves, and a simple lawn mower will do the trick. The extra nutrients from the leaves will promote growth and vibrancy in the spring when most plants emerge from dormancy. The frost and snow from winter is never kind to your plants, and most gardeners and landscapers recommend mulching during the winter months as an added layer of protection since mulch helps insulate the ground and plants around it. Leaves, believe it or not, are a great source of mulch. Simply gather up all of the stray leaves and pat them down around the plants. Not only will this protect the plants during the winter, but the decomposing matter will also add some nutrition to the soil which is great for the plants! If your home still uses a fireplace, then why not use the leaves as burning material to keep the fire ablaze? While we don’t recommend burning leaves outside as a method of destroying them—that’s a surefire way to cause some major pollution—using them as fireplace fuel isn’t so bad, and it’s definitely better than burning paper and cardboard which are treated with chemicals. Leaves are organic, and the result of burning them is carbon. Happy winter, everyone! Halo Tree Service in Shelby Township provides year round services including trimming, stump removal, pruning, and more. This winter, plan to have your trees pruned by us so that come winter, they’re beautiful and thriving. Thanks for reading, and we wish you the best of luck during the upcoming cold months.